Mutation - In 24 hours? a son of a top bureaucrat or for that matter a son of the top Party leaders. Does this amounts to corruption? It means, all citizens are equal before law but some are more equal than the others? Damu says it was done not in 24hrs but in 4 days. for ordering Mutation entry or for completing Mutation process in less than 15 days. Well, Mr. Chief Minister or the Party’s spokesperson Damu for that matter, will you please furnish the so called ‘order’ into the public domain? Parrikar can even do so in his regular updates on his facebook wall. Needed to find out from the ‘order’..
1. Who gave / signed the order and when? 3. What are the conditions or rules (if any) under which mutation process can be completed within 24 hrs. I am also copying to newspapers if then knew about the so called ‘order’ or if they ever brought this up in the form of news item in their esteemed dailies. If this was so simple and quick then why people still go to ‘Mahiti Ghar’ for their Mutation work where they are charged Rs. 5000 or more to get the Mutation done in 3-4 months? (some organised gangs including lawyers even charged Rs.10,000 process of which (they say) also takes 3-4 months. I wonder what ‘legal formalities’ he refers to? 2. Special clause in the Sale Deed to say the landlords had no objection to make new mutation entry by deleting their names and inserting the new owner names. 3. A separate 2 page declaration made and signed by landlords (Seller) to say they have no objection to a new mutation entry after deleting their names. Despite all this, they say, as a rule, Regd/AD notices MUST be sent to all parties (Landlords only in my case, no other parties) and wait for 15 days period from the date of notice. When handed over my new file, I was called after 3-4 days to collect notice (copies of which needed to be posted to all). I went there on 5th day, I was called two days later as they were very busy with some other work. So, after one week I collected the notice, posted to all and waited for 15 days. When enquired on the 17th day (after sending notices), I was told one of 6 ADs not received. So, I need to make a news paper publications saying some notices sent came undelivered etc and that I wish to published the same... For this, I was told to bring an Affidavit..When presented the same, I was told to come back after 3 days to collect the notice for publication. Most recent Requirement (about 18 months ago): Affidavit from the Landlord saying that he/she does not belong to ST/SC Community and a report from local Talathi is also sought in this respect. Some of my cases I referred to above are more than 2-3 years old. In other words, it is nothing but adding a new name, usually by deleting old name/s on the existing Form I & XIV. Other rights holders are those who are not tenants but whose house is located in the said property. E.g. those slums in communidade land or other government property or those houses which were built say over 30 years ago with the permission of the landlord. When we apply for Mutation? After purchasing a piece of land. Get sales deed done, wait for about a week to get your sales deed docs from the registrar. Since you are a new owner now, you have to request for inclusion of your name by deleting the name of the seller (previous owner/s). How do we apply for Mutations? What’s the procedure? Write a plain letter requesting for mutation. Make a file and hand over to the Talati of Mutation at taluka Mamladar’s office. But the office, they will tell you to add more docs etc and it depend on persons/clerks, taluka etc as it seems different rules to different talukas. There is a little fellow with little hands but very big mouth clerk with no smile on his face in the Computer section of the Mutation dept. When I went there with the above 2 documents, he told me to put it in a file. After presenting the file, he then told me to fill in a sort of a check list ‘details for application for mutation’ which is available at the outside kiosk for Rs.10 (it was just a one page photocopy). After that he said bring one blank but stamped envelope with AD (Rs.25) which he say is required for their records. When asked what records? He said (with ugly face) simply do it as said. is missing since morning. I told just keep it and DIY when found. He would simply not accept it. Then I went to the Mamlatdar office to see if I could get one, asked three different person they don’t have it and the fourth one pointed me out another officer saying that he has it. I politely asked him and he was kind enough to lend me after talking it out from his locked cupboard. A ha , my file is finally accepted after 3hrs of ordeal. I was told to come back after 8 days to collect a notice of which I had to make photo copies and post by regd./Ad to all the name occupants in the form I & XIV. It is usually a one page document but if the no. of occupants/tenants/other rights holders are more then it coul go up to 5 pages or more. Just give them the Survey No with Sub.div No. and the taluka and the village. For X (notice) says… that ..if no objection received either orally or written within 15 days from the date of receipt of this notice, it shall be presumed that you agree to the mutation entry etc. The notices to be posted by you to the all parties appears in the form I&XIV –by Regd/AD costing Rs.24 each within India (foreign address costing more). When you are there say after a week or so, they would most likely to send you back saying come after another 2-3 days blaming electricity failure, short staff etc. They will give you notice (Notice form X). Where is the list of occupants on the Notice? Wait a minute, what about their addresses, there are about 75 names? That’s your problem and not mine says the arrogant ToM again. How and where I should find all the addresses? You have to make photocopies of the Notice and post to all parties concerned. At Panjim, they will call you back just before posting to get each and every envelope/notice rubber stamped (with Talathi office address) and if the list is long, they hand over the stamp to you to do it yourself. You then go the post office at registration counter. You send all the notices in the name of ‘Talathi of Mutation’ so when signed AD or the letter received undelivered etc it directly goes to the Talathi of Mutaion. Wait for 15 days plus give another 15days and relax, your job is done? .Don’t even think about it, you are not even half way through. After about one month one has to go there to follow up.. there they will tell some or one notice has come back undelivered/unclaimed/refused/address not known etc. 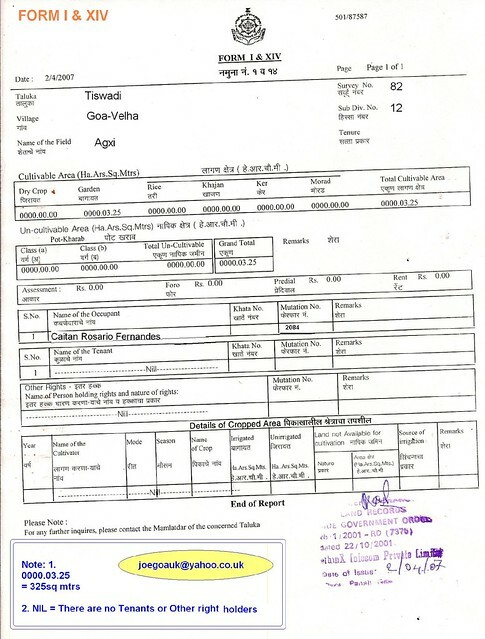 Make an affidavit on Rs.20 stamp paper requesting for alternate service i.e. newspaper advertisement. Depending upon the length of the list/names on form I &XIV, a news paper ad will cost you minimum Rs.1500-3000 to Max say up to 6000-12,000. Tip. Always go to Gomantak Times, it’s the cheapest say 1500 minimum the same may cost you elsewhere Rs.3000. Notice with say up to 20 names will cost you Rs.1500 on GT. News paper notice says ….notice sent to you came unclaimed/refused/undelivered etc and that after 15 days from the date of publication of this notice, if no objection received it shall be presumed that you agree to mutation entry. Take a copy (the whole page with date etc) of the Newspaper Ad, mark it (encircle) with Mutation No. with date and hand over to the office of Talathi of Mutation..
Then what? Wait for 15 days or say 30 days and your job will be done automatically? Say after one month, when you go their for follow up.. They will now say, the file is with CI. Now who is this bl**dy CI? CI = Circle Inspecter, he has to approve it first before making the entry. Some where in the Mamlatdar office. Note: at Vasco, at this stage, they will say..
- Waiting for CI approval, for which You have to see him personally. To catch talathi, you have to go to village panchayat where he comes 2/3 time a week only. ‘I will see if he does when I see him at this office, by paying Rs.200’ says ToM. ‘Don’t worry, I will pay that too’ says the applicant. Below may be good for straight forward cases only. What if you don’t pay them anything? Loss of valuable time and energey. Well, I have two cases pending one at Panjim and the other at Vasco. Waited for required 15 days plus another 15 days. Went to see the Talathi of Mutation, he said the file is with the CI (Circle Inspector). I then went to see the CI, he say it will take some time as he has plenty other files pending before mine. But it took the talathi/computer dept 10 days to transfer the file to the CI who is in the same building and same floor, a room next to each other. Gave CI for Chau Panni, he then took my file case no, and added to his priority list with few others. At this time he said it will be done in 10 days. Waited for 20 more days and seeing that nothing is being done (after checking on the net), I phoned the talathi, TOM, (he gave me his no earlier, and you know why). Guess what? He says the file is now with his Sir. Now, who is this (bloody) Sir? Well, it means, another trip and another hafta? Newspaper ad/Notice put in late Sept. 2008. After waiting for required 15 days and adding 15 more days, went to see the TOI, he said the file is with CI. Went to see CI (Sagar), he was not there. And I did not go to see him again. My case is still pending as on date. I received no intimation from the CI nor the Mamlatdar. At Panjim, I paid to no one yet. Both the cases which I am dealing with are straight forward cases. - I understand that my file is now pending on your desk for more than one month now..
Jt.M: May be, we are too busy now a days. - But my case is pending for nearly one year now..
Jt.M: You have to understand our problems. - So, what you say now? How much more time you think it will take? Jt.M: We don’t have time to do that either. I think, just because they are Malatdars, they think they can talk any rubbish. At no stage the Jt.M shown any concern to the problems faced by the citizens. He say come and try during February 2009 and I am sure he will then say ‘we are busy with the forthcoming parliamentary elections (April/May) and the process of which could take till July 2009. Don’t understand why it take him such a long time. The main hurdles in the case already passed through like Village Talathi Report, Issuing postal notices to all parties concerned, then news paper advertisement/notices, Circle Inspector report etc etc. Plus the money paid as bribe about 1000 in total to Talathi, TOM & CI. I am sure, if I had paid to the Jt.M (say another 1000) he would have taken my case up finding some time in his so called busy schedule. This was a straight forward case. Father-mother give a small piece of land to their son by means of Gift deed. Only two parties son and the parents and I thought there was no need to send notices to parents as this was come to son from parents as gift deed. They said notices are required to be sent as per rule. New mutation File case prepared and went to handover Panaji Mutation office on Friday. I was told, today is not the day for my village to accept files, come back on Tuesday or Thursday. Came back after 3 days to see the Mamlatdar, collected the file and I was directed to make entry (Computer section). There I was told to pay the mutation fees Rs400 (I think recently gone up to 1,000 for upto 1,000 sq mt area, 1001-10,000 = 2,500 and above 10,000 is Rs.5000). About 5 years ago there were no fees or just a Court fee stamp of Rs.5. After payment of fees and file entry, I ask when to come next for notices, the arrogant computer clerk said ‘come after 21 days’. I ask, why 21 days where it was normally done in 2-3 days? Straight went to Jt. Mamlatdar office but he was out, then I went to Mamlatdar office (Head) and asked him why the clerk calling me after 21 days just to collect a notice? At least he was not rude, very politely asked me to come back and see him (Mamladar) after 7 days for notice. After 7 days notice collected from Mamlatdar (I know he personally got it done as he told me to wait for sometime on the day). 21 days later, I went there for enquiry but the arrogant clerk sent me back for I had fee receipt and not Notice copy. He could easily find out details by referring to fee receipt or their register though. Next day, I went again this time I was told AD still not received and called me back after another 7 days. I asked, what next now? 7 days later, when I checked Mutation status online..
Aha, all done 5 days ago. 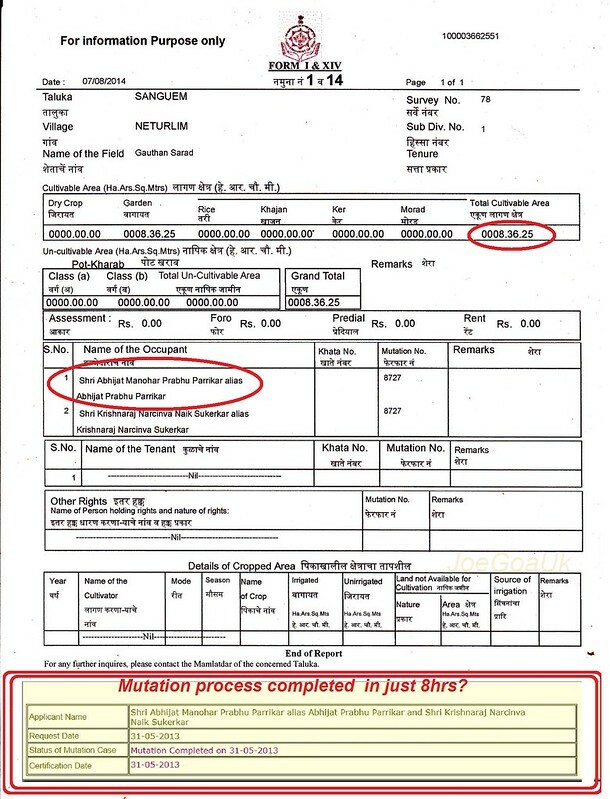 Note: I also filed a general but Mutation related RTI application earlier. How to get your Mutation done quicker? There are agents including some lawyers having nexus with Govt Babus, 2 years ago, the going rate for mutation work was Rs.10,000 (lawyer's quote) with approx. time frame given 4 months but it takes longer.. In many cases, it may be possible to get your Mutation done as quickly as possible say in two weeks or even one week’s time (but not in a day as in Parrikar's son). Again, when you purchase land from landlord or from any other party it can be lot easier or quicker than purchasing from Real Estate developers or builders from a block of subdivided plots. Get all parties appear before Mamlatdar giving no objection to the mutation entry. ‘In case of Mutation in respect of sub divided approved plots, the definition of 'interested parties' would mean only the vendor/s and the occupants of adjoining plots only and notices shall be issued to the vendors and owners of adjoining plots only'. go to Mamlatdar directly (not Jt Mamlatdar) and ask..
Why it taking so long? How come Parrikar son's was done in a day? Do you want me to file an RTI ? Dy. Collector, Talathi, Head Clerk suspended. Mutation process to starts from the day of sale deed from Sub-registrar. which means, there is no need to file or visit for Mutation at Mamlatdar offices. Whole Mutation process to be completed in 90 days (time bound) with or without objections. also claimed about 7000 MUTATION cases cleared in 90 days. Also, on one single day i.e. Saturday  about 300 cases cleared of both North/South Goa. There are about 53 manlatdar in the State of Goa that's about 4.5 per Taluka. Salcette has 7. There are plans to get PARTITION process done  in 90 days too. 30 SEPT 2016.......South Goa Collector clears 400 mutation / partition cases in a day. If you have been waiting for years this is good news indeed, however if your newspaper notification is not yet done please wait another 6 months atleast or until elections are over as all Mamlatdars and government staff is busy with elections.